Duralactin Canine Joint Plus Soft Chews are formulated with 8 proven ingredients that work together to help maintain healthy joint function and mobility for your dog. 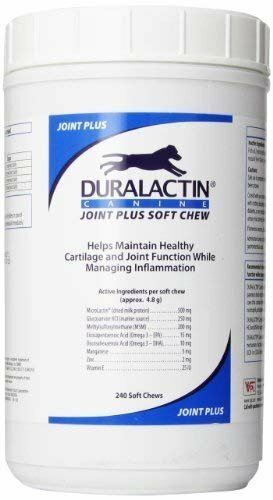 Duralactin Canine Joint Plus Soft Chews help reduce inflammation, maintain healthy joint fluids, reduce free radial oxidation and support joints and muscles. 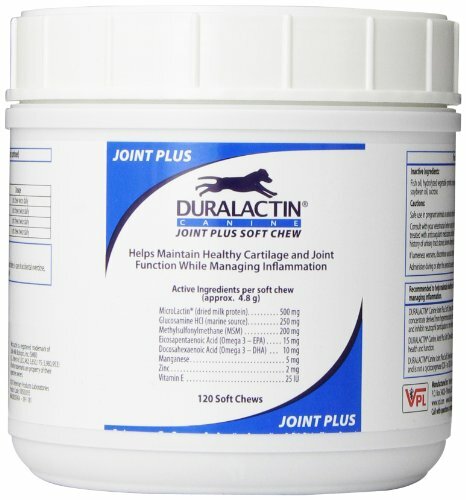 Duralactin Canine and Feline Liquid provides long term management of chronic inflammatory conditions in dogs and cats. Microlactin protein helps reduce inflammation, maintain healthy joint fluid and supports joints and muscles without harmful side effects. Palatable soft liver flavored chews visible results within four to seven days.